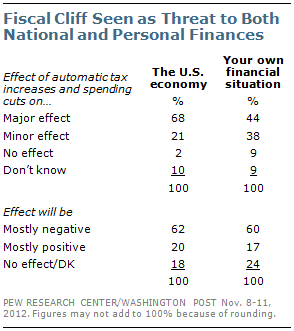 Nearly seven-in-ten (68%) of Americans say there would be a major effect on the U.S. economy from the automatic tax increases and spending cuts that would be triggered if the White House and lawmakers failed to reach a deal to avoid the “fiscal cliff.” Almost as many (62%) said the impact would be mostly negative. A smaller number (44%) of the overall public – including those who believe the effect would be minor — say the impact of the tax hikes and spending cuts would have a major effect on their own financial situations. However, among those Americans who believe the effects on the economy will be mostly negative, 60% say they expect an adverse impact on their own financial situation if no deal is reached. Republicans and Democrats take somewhat different views on the effect automatic spending cuts and tax increases would have on the economy and their own personal finances. Republicans are more likely than Democrats to say there would be a major effect on the economy (78% vs. 64%) as well as on their own personal finances (54% vs. 39%).